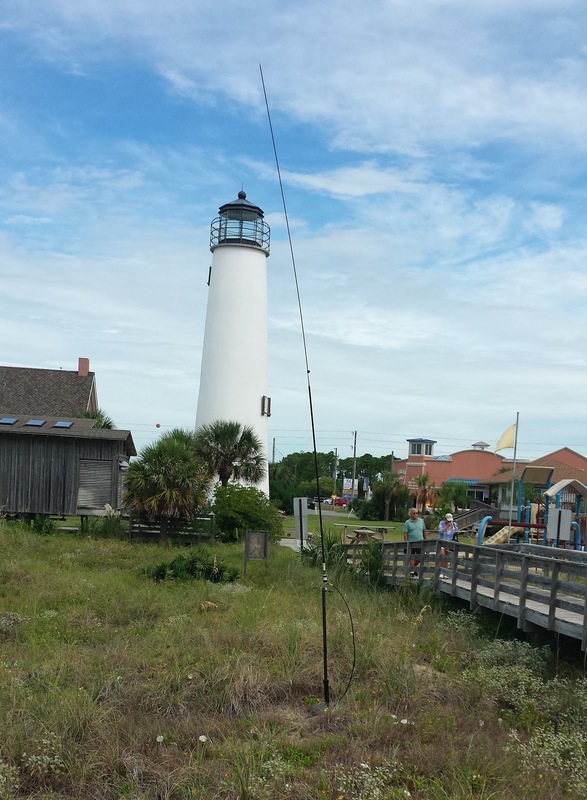 The US islands W/VE QSO Party on Saturday 29 August has turned into to a get away trip to St. George Island, Florida for Linda and me. Suzy is going too. I enquired and got permission to use the St. George Lighthouse for an antenna support. I am having a self debate on antennas to use. I am thinking currently to use a 20 meter dipole as the main antenna and then a sloping 60 foot wire to the ground for the other bands.The sloping antenna is the Chameleon Hybrid Micro. I will use a single line over the lighthouse railing. I guess I will go with my Field Day portable station based on the Icom 7100 and a 40 amp hour battery. The WX is touch and go with thunderstorms predicted. 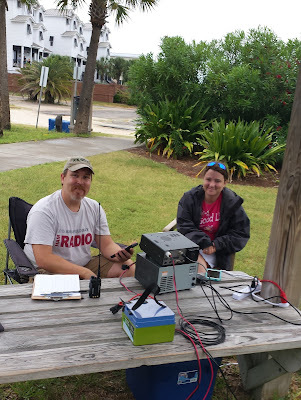 I will be operating under our club call W4RYZ for Panama City ARC. 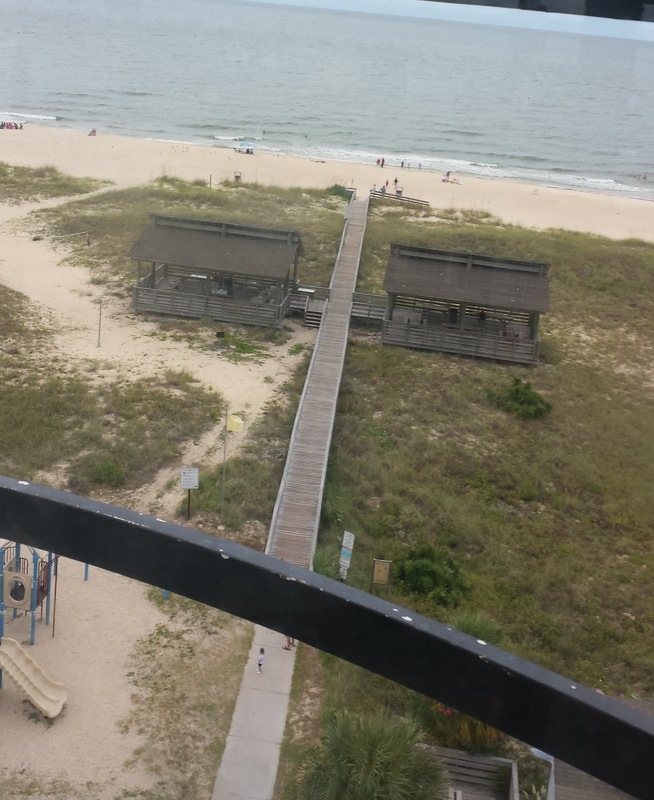 There will be other ops from our club setting up at the State Park or helping me out at the Lighthouse. The US Islands W/VE QSO Party is 1200z 29 August – 0300z 30 August, 2015. 15 Hours. I will be focusing on 1500 to 2100 or 10 am to 5 pm Eastern Time. Our operating frequencies are 14.250-14.260 (main) 7.250, 21.350,and 28.450 mHz phone. 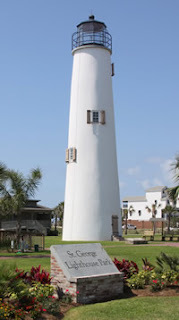 The US islands designator for St George Island is FL007S. More on the QSO Party information is at http://www.usislands.org/ Information on the Lighthouse is at http://www.stgeorgelight.org/ and the State Park at https://www.floridastateparks.org/park/St-George-Island I am looking forward to many contacts including RaDAR operators. I was pleased to attend the Huntsville Hamfest this year. My wife Linda joined me. We met up with John W8JER and his wife Micky KE8ASK from Sturgis Michigan. I also met my buddy John K4KQZ from Columbia Tennessee. Saturday in addition to shopping, I attended the QRP presentation on portable antennas by Craig NM4T. 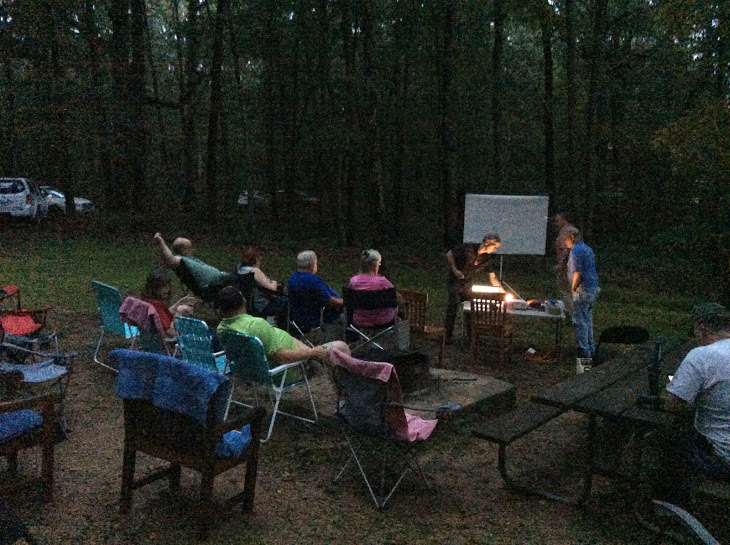 The highlight of the trip was the QRP BBQ that Craig puts on Saturday Night at the cabins on Monte Sano. There were three RaDAR Ops there. First was Don KK4QAM and his wife Carol. I found out Carol is KK4VBT, a General Class, and likes JT-65. Second was Steven N0TES AKA Wise Seeker on Google+. He owns Alpha Antennas. The third is Craig NM4T known as the "Huntsville Guy." There were LNR radios to try out including the Mountain Topper and the LD-5. Of course there were LNR antennas in the trees. Craig gave us some tips on island operating like "Buddies in the Caribbean" along with videos. We also heard about SOTA. I gave a short talk on the K-Tor pedal power generator and the supercapacitor bank. Jerry N4EO volunteered to do some pedaling. Thanks Jerry! In the shopping department, I got an LNR 40/30/20 End Fed to go along with my LNR Mountain Topper. My best deal was a copy of the Stealth Amateur Radio book by Kirk Kleinschmidt for $4. It lists for about $150 used or $200 new on Amazon. Sorry I just did not get many photos. The one above is by Steven. 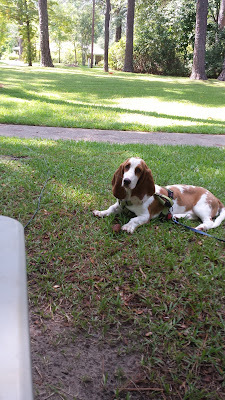 I combined a trip to my Parent's in Dothan, Alabama and the NJQRP Skeeter Hunt event. The house is where I grew up and has many tall pines. So I went with the 40/20 fan dipole in the front yard.. I used my Big Shot sling shot to get the center support line over a limb. There were higher limbs but my choice was up about 30 feet high. I did not start hanging the antenna until the start of the hunt. It takes a bit of time to secure the dipole ends and so forth. I did did not get the first contact until a hour had past. The conditions could have been better. there was plenty of QSB. 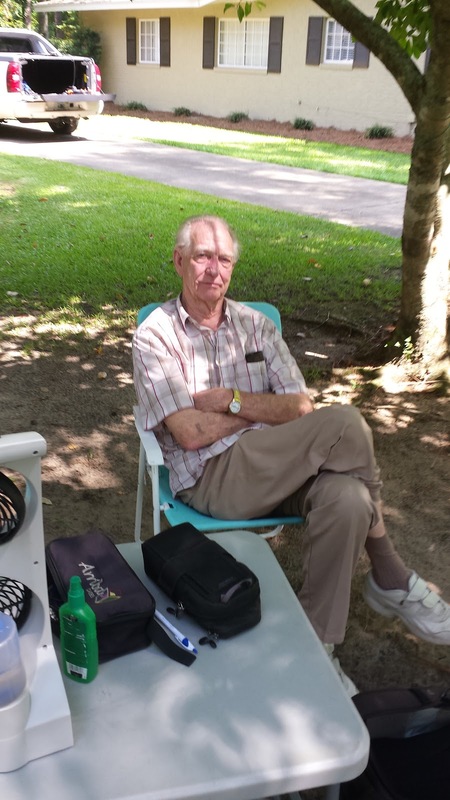 On 20 CW I worked a string of six including KX0R, W2LJ, N3AQC, NE5DL, WD8RIF and N3CU. I checked 15 meters CW and I worked N9SE doing SKCC.Then I mixed in 20 SSB and picked up three doing the Maryland/DC QSO Party. On to 40 CW Iworked N5GW doing the hunt. Not much more there so I went to 40 SSB. 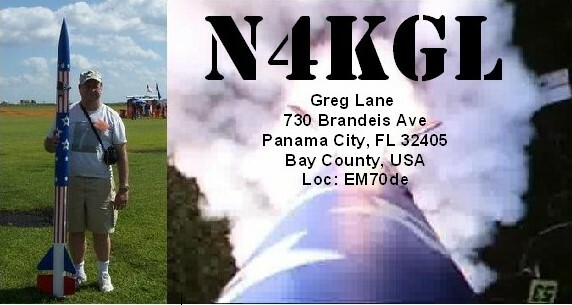 I worked K9HAM running a net on 7.285 and AK4YF on 7.255. My final jump was to 15 CW and worked N3AQC doing the hunt. I heard KC5FM/M a mobile skeeter on 20 SSB but he could not hear me. I also was called by someone on SSB too weak to copy. So lets see I count 9 CW contacts and 8 were Skeeters. There were 5 SSB contacts and none were Skeeters. So that was 14 over two and a half hours as I packed up 30 minutes early. 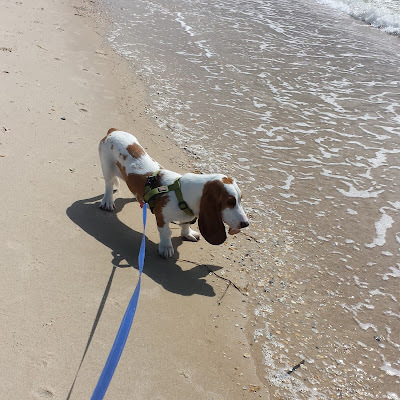 I was assisted by my Dad, Tom WD0HBR and Suzy our basset puppy. We took advantage of the shade. I enjoyed mixing up CW and SSB. 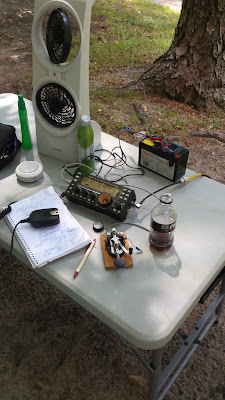 The KX3 is a fine rig for that.Thanks to Larry W2LJ for setting up a nice QRP event. The local skeeters in the yard found me I did not need to hunt for them!